I read In a Dark Dark Wood by Ruth Ware about a month ago and enjoyed it immensely. It was the rare thriller that felt exciting, thrilling, emotionally grounded and funny. A true delight. 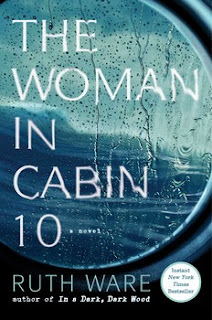 So I was really excited to get to her new book, The Woman in Cabin 10 as soon as it was released. At first I thought I might have to slog through it a bit as there's a fair bit of set-up. But like In a Dark Dark Wood, the main character is leaving home behind to go somewhere else. In this case, she's a travel journalist and this is her big chance to cover a cruise. But shortly before Lo goes, a crime is committed against her, she fights with her long time boyfriend and her emotions are high. Once aboard the ship, she is reunited with a former lover and meets many interesting people. But she also witnesses a murder her first night aboard the ship. However, once she reports the crime, the evidence disappears. Despite an ensuing investigation, no evidence actually remains, but Lo is sure of what she's seen. She continues to dig, but as she does she starts to feel under threat herself. In such a closed environment, the stakes are high...but surely the evidence is impossible to high? Or has Lo gone crazy? I ended up REALLY LIKING this book and the turns it took. But the atmosphere is also pretty great, too, the sense of being trapped and alone in a space you can't get out of it. Ware has a great sense of mystery and the ability to develop really great characters you can't help but root for. There are things about her characters that linger in my mind long after I finish I book which to me is the greatest! And I really want to be able to say more but it would ruin the whole plot! But it's frustrating because there's a very unique thing that happens that made me like it more. Anyway! Great thriller, Ware is one of my favorite new finds, recommend! I received a digital copy of this book from the publisher.